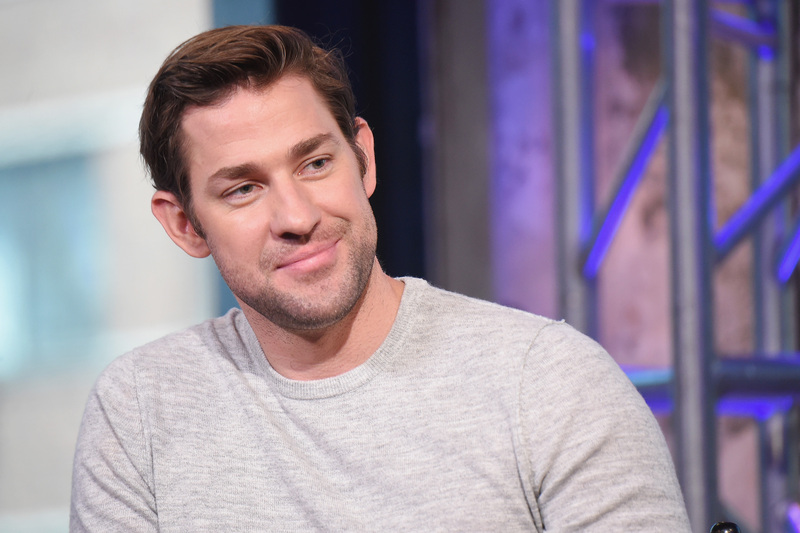 I'm still not over the incredible news that John Krasinski will play Tom Clancy's Jack Ryan in a TV series about the CIA Analyst. Produced by Paramount TV and Skydance for Amazon Studios, the new show has already had the go ahead for a 10 episode first season, without a pilot. Basically, Amazon understands what their audience needs — to see Jim Halpert in a lead role that requires him to be an action hero. Yes, please. But when will John Krasinski's Jack Ryan series air? We're going to have to be a little patient with this one, as we'll probably have to wait until 2017. Even though Jack Ryan is looking at a 2017 premiere, according to IMDb, Krasinski's schedule is looking surprisingly clear. The actor is currently promoting his movie The Hollars opposite Anna Kendrick, and is especially involved in promotional activities because he also directed the film. Clearly, making The Hollars must have been quite a strenuous process, with Krasinski on both acting and directing duties. But now that the project has wrapped, The Office star has a lot more free time to — oh, I don't know — become a CIA action-hero-type thrown into world-threatening situations when he least expects it? Sounds good to me. The only other project starring Krasinski that's currently in production is forthcoming animation Animal Crackers, which happens to co-star his wife Emily Blunt. As the animated movie only requires voice-work, it's unlikely to take up much of the actor's time, meaning that the next thing he'll start work on is Jack Ryan. Since the show has been ordered to series without a pilot, there's clearly a lot of faith in the creative team behind the show, and its leading man. It seems likely that Krasinski's schedule is clear because he's known about Jack Ryan for a lot longer than us, and has been preparing himself accordingly. In preparation for his role in 13 Hours: The Secret Soldiers of Benghazi, the It's Complicated actor underwent quite the physical transformation. The actor was never out of shape, per se, but 13 Hours gave him the opportunity to hit the gym and work on those abs, which are arguably the assets that won him the role of Jack Ryan. On The Late Show With Stephen Colbert in January 2016, Krasinski joked that wife Blunt wasn't a fan of his new, super-toned look. He said, "She hates it. She would way prefer to have doughy guy back." While that so-called "doughy guy" was cute, I'm more than a little excited to see the former Jim Halpert take on an action-packed TV role. Since filming should be starting soon on the Jack Ryan TV show, hopefully Amazon will take pity on us and reveal a firm premiere date for its newest series, as close to January as possible. Basically, 2017 is going to be amaze.